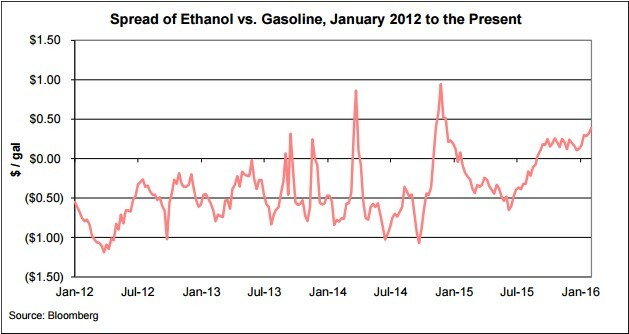 Since August 2015, ethanol has traded at a premium to gasoline which is unusual by historical standards. This is likely to continue until oil prices rebound into the $45-50 per barrel range. Even with this situation, 2015 ethanol production managed to post a 3.8% growth for 2015. And in the midst of the seriously depressed oil market of 1Q 2016, ethanol volumes have produced year on year growth in the first two months of this year. The downside for producers is that production margins are near their lowest levels since 2012 . There is an incentive for blenders to use Renewable Identification Numbers (RINs) credits they may have accumulated, because ethanol is more expensive than gasoline. It is more expensive to blend the extra ethanol into gasoline while the logical economic benefit is to use the RINs for any obligation that they’re not covering with their 10% blend. In addition the issue of the blend wall has not yet been addressed. So tight, or in some cases non-existent, crush margins are crippled by substantial debt and assets, most of which are in negative equity. Increasing stockpiles of oil, and Russia confirming this morning that no legal agreement has been reached on reduction in oil outputs. Iran is now looking to regain market share after the easing of sanctions. Oil prices look set to be spiking merely on short term covering and could drop back to test the lows of $26. Ethanol M&A, work on ironic inverse relationships. Transaction numbers spike after bad times and dip during good times. High margins work against deals. Low margins produce them. Simply put, when profitability goes up, ethanol M&A activity generally goes down. For example, after the 2008 downturn 29 ethanol plants traded hands in 18 transactions before the end of 2010. Improved margins, starting in 2010, yielded only five ethanol plant acquisitions in four deals in 2011. Production margins sagged in 2012, spurring the sale of six ethanol plants late in the year and setting the stage for double-digit transactions in 2013 when 13 ethanol plants were acquired in 10 transactions of that year. The ethanol industry then cycled into an 18-month stretch of record margins from mid-2013 through late 2014 which explains why there were only five ethanol asset transactions completed in 2014. However, the debt fallout remains and in June 2015 Petrobras announced their intention to sell off nine of their sugar and ethanol production plants. On Aug. 26 2015, leading turnkey sugar and ethanol crushing plant supplier Dedini filed for a court-supervised debt restructuring. In September 2015 India’s Shree Renuka filed for creditor protection in Brazilian court. In the late 90’s, the EU market of ethanol was in surplus with a production of around 2 billion litres, out of which 1.3 billion litres was of agricultural origin for a demand of around 1.7 billion litres. Today, with the production of 6 billion litres (1,585 MMGY – million gallons per year) of agricultural ethanol within the EU for a domestic market of around 7.9 billion litres (2,087 MMGY), the EU is a net importer of ethanol. The EU ethanol industry is highly protected as the EU imposes a tariff of €0.19 per liter ($0.72 per gallon) on undenaturated ethanol and an import duty for denaturated ethanol of €0.10 per liter ($0.38 per gallon). With the Transatlantic Trade and Investment Partnership (TTIP) trade agreement between the European Union and the United States such tariffs may well be reviewed. However, with a risk of low cost ethanol dumping, which was the reason tariffs were initiated in the first place, it may well be that the EU lobby groups will demand implementation of non-tariff barriers such as sustainability criteria. Cereals are now the main feedstock used for ethanol production (67%) followed by molasses from sugar beet (27%). Ethanol production currently absorbs only 3% of EU cereal production so does not play an important role for the European cereal market. This is in stark contrast to the 40% of corn production used for ethanol production in the US. Second generation cellulosic ethanol in the US was knocked back by the Obama administration on Nov. 30, 2015, with news that there would be no aggressive set cellulosic targets or increase in overall ethanol numbers — leaving cellulosic projects in the unenviable position of competing for market share with first generation ethanol. Guidelines within the EU Commission for environmental protection and energy 2014-2020 indicate that EU State aid investment in new and existing capacity for food based biofuel is no longer justified. State aid investment is only allowable for the conversion of food-based biofuel plants into advanced biofuel plants to cover the costs of such conversion. Therefore investment aid to biofuels may only be granted in favour of advanced biofuels. No, not by a long shot. The US ethanol industry is highly fragmented. There is ongoing consolidation, but it is far from over. The top six ethanol producers, those with more than 500 MMGY of production capacity, make up 45% of industry wide capacity. The remaining 55% is comprised of 140 plants, divided among more than 50 companies. This includes a large number of farmer co-ops, most of whom own only a single plant. Needless to say, this landscape creates room for large multi-plant operators to improve efficiency across areas of energy, by centralising marketing and logistics and increasing the margin crush by balancing low margin ethanol with higher value added biochemicals compatible with ethanol production.